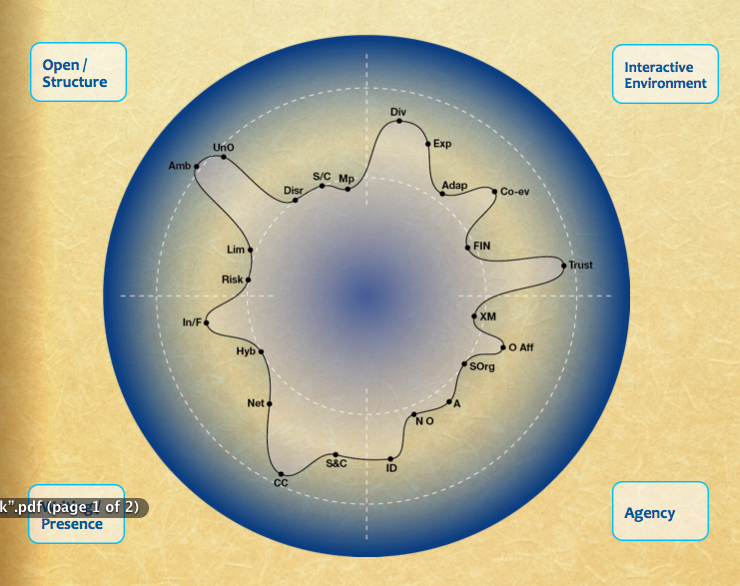 Footprints of Emergence – so what? I anticipated that we would get this question at our ALT-C workshop, Learning in the Open, and we did get it. Or rather, we got the comment – ‘I can’t see the point of all this’. I anticipated the question because it’s a question I have been asking myself, and Roy and I had a long discussion about it on Monday evening. Having written a couple of research papers and run a few workshops on our ideas about emergent learning we know that this is not an easy question to answer. We also know that what we have been thinking about and discussing since 2008, is not easy to put over in an hour’s workshop. So I will try and answer this question, ‘Footprints of Emergence – so what?’ in this blog post, as succinctly as I can. 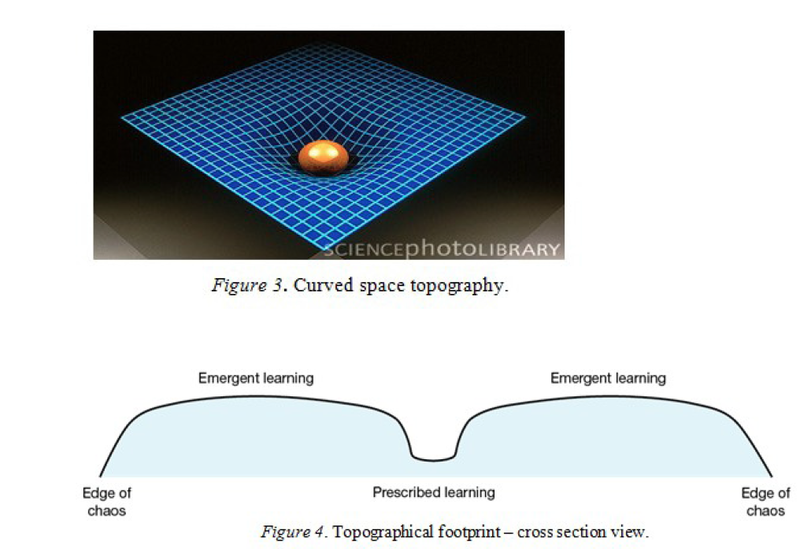 This description and visualization will tell us something about the balance between prescriptive and emergent learning. It is a snapshot in time, which describes the perspective on learning, from a learner or designer viewpoint, or a collaborative group viewpoint. In this process we are increasingly aware of the difficulty of describing the learning process. 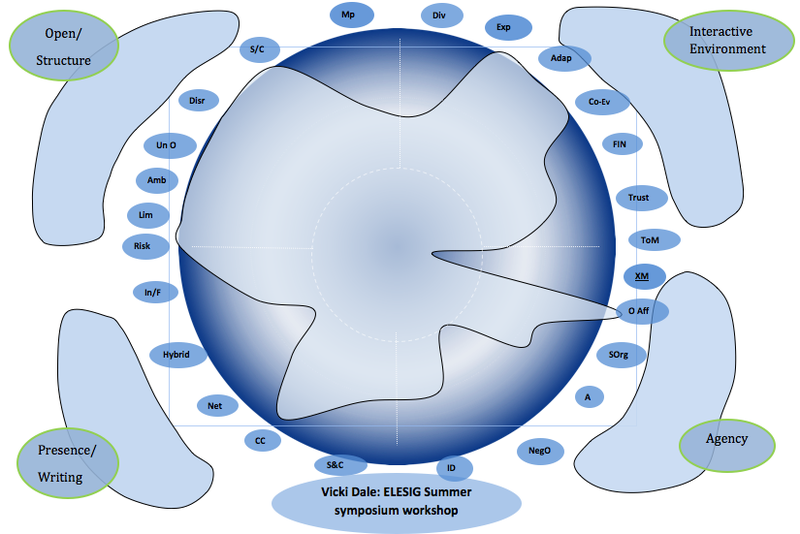 So that’s the ‘what’ about footprints of emergence – what about the ‘so what’? 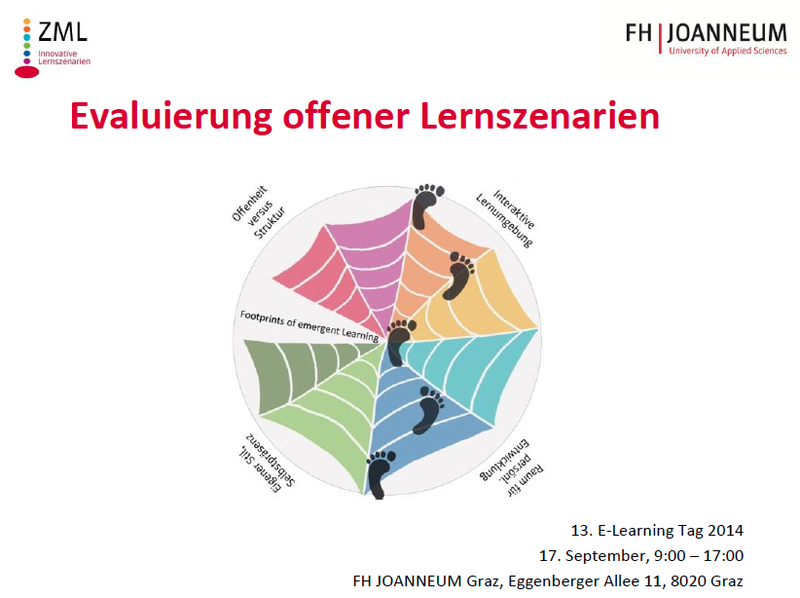 Imagine you have now figured out what we are talking about, you know what a footprint is and you know how to draw one and you now have one that, for you, describes your learning experience in a named learning environment or course. So what? Roy and I have had to consider why we have invested so much time on this and continue to spend literally hours discussing it. What follows is where I am up to with my thinking. As was discussed at the ALT-C conference, we live in an age, where much of what we know about traditional ways of learning and teaching, is being challenged. As someone said to me at the conference, students know a lot more about social media and IT than their lecturers and always will, and they are no longer content to ‘sit in a VLE’ and do what they are told. They are literally all over the web, doing their own thing, in spaces of their own choosing, interacting with people far beyond the confines of their own course or learning environment. They have scaled the valley sides of the prescriptive learning zone of a traditional course and are out on the open plateau. In these complex open learning environments, it is impossible for the tutor to see or know about everything that is going on. Much of the learning is surprising, unpredictable and emergent. 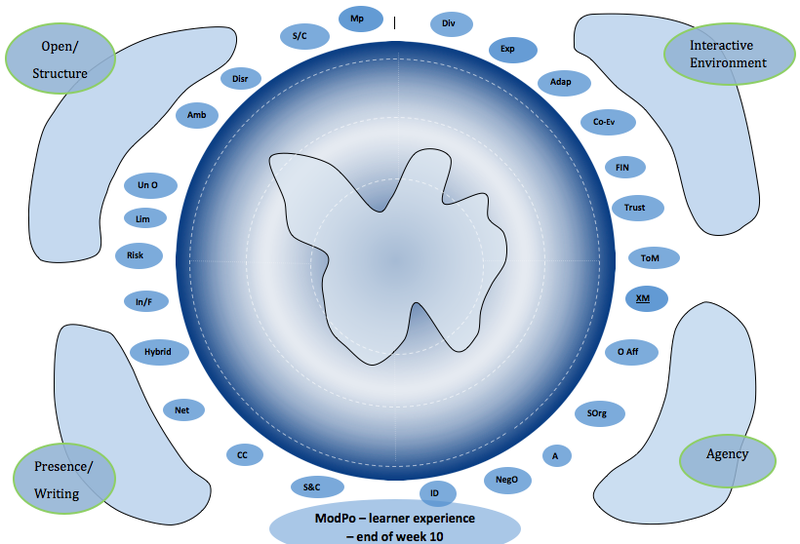 MOOCs in particular, which are designed as open learning environments promote a wealth of emergent learning. This emergent learning will have a profound effect on learner identities and their sense of who they are and who they are becoming. You only have to scan through the discussion forums of cMOOC to see evidence of this. Since more and more learners seem to be gravitating towards open learning environments, emergent learning can no longer be ignored. But how can we ‘capture’ and articulate its meaning? This is what we are trying to do through the process of drawing Footprints of Emergence. The drawing process relies on consideration of 25 factors which influence the balance between prescriptive and emergent learning. 25 factors is a lot – so it is not a quick or easy process. It is messy and difficult, but then learning is messy and difficult. Determining how these factors influence the learning or design process requires careful thought and discussion and the surfacing of tacit knowledge and understanding. It is this surfacing of tacit knowledge and understanding that we believe to be the ‘so what’ of Footprints of Emergence. To learn and work effectively in open learning environments, learners will need to have the ability to reflect on who they are and who they want to be. Depth of reflection is a skill that all learners need, and will increasingly need for professional development in an age when they can no longer easily predict their career paths. We believe that the Footprints of Emergence offer a process for supporting this development. Our paper “Learning Across Cultures” has been accepted by SEAD and posted on their site along with a number of other papers. ‘Our’ refers to Roy Williams, Simone Gumtau and me. The next stage is a ‘meta-analysis’ of all the actions suggested in the different papers and a review of the papers in line with the review process posted on the SEAD website. There will be a preliminary presentation of the study at the US National Academy of Sciences in Washington DC at a Leonardo DASER on May 16 2013. When the study is finalised, our full white paper will be included in the Appendix. It will be interesting to see the outcomes of the meta-analysis and whether the final report has any impact on transdisciplinary, cross-cultural collaboration between the sciences, engineering, arts and design. We had a great discussion about our recent paper Footprints of Emergence in CPsquare’s Research and Dissertations Series of presentations last night. By we I mean, Roy Williams, Simone Gumtau and myself and by CPsquare I mean the community of practice on communities of practice. We had some technical difficulties in getting connected and we were small in number, but if ever there was proof that ‘small is beautiful’ in terms of quality of discussion, it was in last night’s discussion. Some interesting points came out of the discussion. Each footprint is a ‘snapshot’ in time. This was so well observed and noted by John Smith (Community Steward of CPsquare). ‘Snapshot’ describes it so well. They are also snapshots from an individual, or specific group perspective. John said ‘emergence is in the eye of the beholder’. So true. The footprints can be drawn prospectively and/or retrospectively, dependent on the context and purpose and we discussed a variety of ways in which the footprints have already been used and the case studies we have published in the paper. 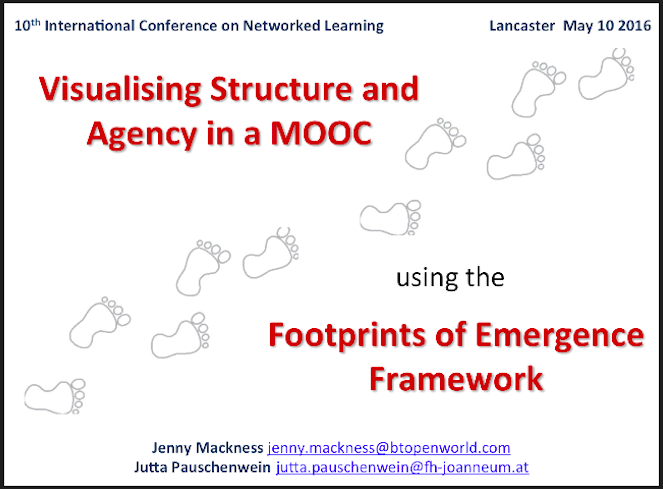 The footprints are about the balance to be achieved between prescriptive and emergent learning. We are definitely not saying that in any given learning environment ‘emergent’ is right and ‘prescriptive’ is wrong, or vice versa. It is difficult to determine exactly where on the footprints the points should lie at any point in time. In determining this we are very aware that the very next day, next hour, we might place them differently. The value is in the discussion or thinking about where to place them. John contributed an interesting perspective from his reading of Barry Boyce and James Gimian, The Rules of Victory: How to Transform Chaos and Conflict–Strategies from The Art of War (Boston & London: Shambhala, 2009). and thought that ‘the strange produces the conventional and vice versa’ and that many of the metaphors and issues from the book can be brought over to the same issues that we are discussing in relation to emergent learning. We definitely need to explore this further. And right at the end of the discussion, the issue of ‘awareness’ was raised. As Roy put it … a possible ‘scenario is that as more people draw more footprints, and they become more ‘aware’ of the dynamics, they are less able to interact with (or in) full ‘awareness’. This takes us into a whole new realm of discussion for me, so I’m looking forward to seeing how it develops. But in the meantime – Roy has set up a wiki for further discussion. If you are interested in our footprints framework and would like to contribute a footprint to the wiki, Roy, Simone and I would love to hear from you.